Sometimes I really miss living near mi hermano, The Amazing Steanso. Sure, he's lice ridden and smells like that white-cheddar Mac and Cheese they serve you in elementary school, but aside from his incontinence, I like to think he and I have a lot in common. Namely, we both really, really like bad movies. More specifically, we could always get each other excited about going to see a movie with a somewhat promising premise which we knew had been an utter failure in its execution. And with commercials now running ad nauseum for Constantine, I am missing Jason more than ever. BY GOD, we would have been out to see that one opening night. Constantine is based upon DC's Hellblazer comic, a long running title featuring a lower-class Brit who happens to know quite a bit about the world of magic. John Constantine was envisioned by Alan Moore, the same guy who gave us From Hell, League of Extraordinary Gentlemen, Watchmen and numerous other ingenious comics. (note: some of these have been translated into abysmal movies). The trick to the comic is that Constantine isn't Merlin. He's not flying around on magic carpets and shooting lasers out of his eyes. Constantine uses the sort of magic that if he swings a dead cat around his head for half an hour under a blood-red moon while chanting the words to "House of the Rising Sun", he might somehow come out on the winning end of a bet. It's that sort of voo-doo, witchy magic. The comics are pretty good, and I followed them for years until they got on a creative team I didn't like, and I just never got back into Hellblazer. Constantine's story is basically about a guy who, when we meet him, we know, no matter what, he is going to Hell. He tends to get his friends killed, he tends to lie, cheat and steal to get the job done, and he literally makes deals with the devil (hey, it's how he beat lung cancer...). So, right... Kind of a cool, grubby, underground comic which isn't looking for superheroes overhead, it's looking at the worms in the gutter. Technically, in a lot of ways, Hellblazer is a horror comic. Now, essential to the comic is the fact that John is lower class, middle-aged and British. John's roots in late 70's punk bands, Thatcherian-era recession and whatnot are key character elements in a book which relies 95% on character and 5% on plot. Flat out, this SHOULD have been a Gary Oldman vehicle, and instead we have Ted S. Preston, Esq. At least he's smoking and wearing a tie. That's a start. The movie also appears to be an action flick. Translation: the producers optioned another comic in the wake of Spider-Man's success, only to find out the comic was about a chain-smoking Londoner who stands around a lot using the "f-bomb." Unsure of what, exactly, they should do with the material, they cut it down to the few times Constantine has ever been depicted running, and voila! I am so hoping I am wrong. I really am. But, somehow, I have a really bad feeling about this. Sometimes you wish they would just rip off the source material, rename it and sell it as something new rather than demonstrating that they totally did not understand what they bought in the first place. I'll probably still go see this movie. I don't know why, but I'll probably still go see it if Jamie is game. But I guarantee you, Jason would be PUMPED UP to go and see this flick, and he'd have $6.00 for a coke and popcorn, too. Hey. Jamie is feeling a bit low about being so silent of late here at The League. She's making some delicious Polynesian Chicken at the moment, but she said she wants to say "Hi." Hi. From, uh... from Jamie. The League has never been a huge fan of Thor. Yes, yes... we understand the Kirby connection and that he's a classic Marvel character, but I've just never been nuts about the comics he's been in. Hey, I know... I'm as surprised as you are. The good thing about commercials is that the characters usually appear unaltered, and sometimes it's cool to see these characters appear in the living flesh, doing their thing, untouched by Hollywood costume designers. The best part is that Thor is hawking credit cards. Why does a Thunder God need credit cards? No one can say. But I am sure if the Avengers issued Thor a credit card, he would be sure to run up charges and skip town. But nothing was as disturbing as the 1997 Baby Ruth ad starring DC's own Hawkman. The League is sick of being sick. I headed into work this morning, and about half-way there realized I had made a terrible, terrible mistake. Well, I thought, you can tough it out. About 1:20 I realized that I was unable to actually understand what my co-workers were telling me and that I just sort of wanted to lay down under my desk, and so I headed home about 2:00. I shouldn't complain. This is the first time I've been this sick since I escaped the ragweed and moldy weather of Austin. Once every three years ain't that bad. And given Jamie's laundry list of medical fun, I have absolutely no room to complain. Of course, she totally is nice when I'm feeling run down, which makes me feel totally guilty as I think I've become a bit jaded to Jamie's ups and downs. The question now is: Do I try again for work tomorrow? After all, I actually feel worse now than I did this time yesterday (despite my heartbreak at the Suns' loss to the mighty Memphis Grizzlies). I would like to feel better for the weekend. And I would like tickets to the Suns game Saturday night. I do not think either will happen. While the rest of you suckers were watching that dude in the State of the Union Address (and alternately nodding solmenly in agreement or throwing Fiddle Faddle at the screen. You know who you are.) The League was getting caught up with his new Batman: The Animated Series DVD. Pretty sweet stuff. These episodes are each little master strokes of animation with a distinctive voice, character and perspective. Unlike most cartoons, the logic and storylines are always tight, while still being cool stories for ages 3 - 90. My Superman DVD's also made a showing, but Jamie is indisposed this evening and has made a special request that I delay viewing them until she can participate. Mel, on the other hand, has taken his Superfandom into an entirely new direction and decided to guest-star in an upcoming episode of Smallville. Mel is delighted to be guest-spotting on the upcoming "Krypto" episode of the WB's Smallville. I now much watch my collection lest the opposition forces take hold of Lt. Spider-Man and Captain Superman. The League has fallen ill. We done got ourselves the bug that's going around the office. So, you know, for the first time in quite a while, The League is taking a few days off to lay in his own cloud of germs and feel funky. Last night, due to the lack of breathing and hacking and coughing, The League decided to exile himself to the guest room. Mel decided to sleep on the floor. Unfortunately, Mel snores more than The League, so The League was waking up every half hour poking Mel so he'd knock it off. Anyway, The League still feels funky, but not nearly as funky as yesterday. Or, especially, not as funky as Sunday night when The League was seeing a bright light and the spirits of his ancestors. Ya'll take care in The League's absence and drink plenty of juice. 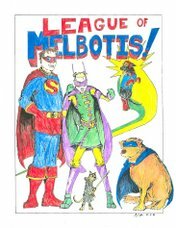 Heidi McDonald has added a link back to The League at her website which is read by, literally, more than a dozen comic fans. No, seriously, Heidi's blog is top of the top the world of comic related websites. It's kind of cool to be blog rolled, even way, way, way down the page. But! I'm also not exactly a creator, am I? That was super of her! Heidi gets a Mellie. Food Network is really weird. They have a show about tailgating starring either someone who looks exactly like Holly Robinson or else it IS Holly Robinson refusing to take her career off life support. Good for her. All she is doing on this program is introducing segments on how people tailgate around the country. This requires her to stand over a Weber and jab a fork into meat on the grill. It says on IMDB that Holly is the daughter of Gordon from Sesame Street. Huh. But not the Gordon I am familiar with. Apparently Sesame Street swapped out Gordons at some point. Sometimes what I learn on the internet creeps me out.